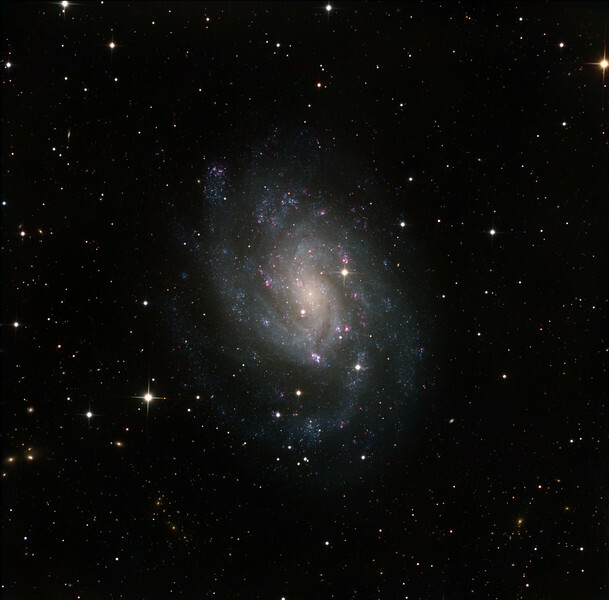 NGC 300 in Sculptor, a near-face-on barred spiral, very bright at mag 8.3, and very close and large on the sky, so of low surface brightness. Thought to be gravitationally bound to NGC 55, interations with which might explain why it is so blue. Squillions of tiny blue pinprick OB regions mark out the spiral arms. There are half a dozen or so red rings (HII regions). The background is worth exploring, with huge numbers of distant galaxies, many very reddened, some forming galaxy clusters. Notice the long tidal tail on the seahorse-like galaxy toward ten o'clock. Lum: 10 x 1hrs unbinned; RGB: each channel 4 x 1hrs 2x2 binned. Total exposure 22 hrs. Aspen CG16M on 20" PlaneWave CDK on MI-750 fork.